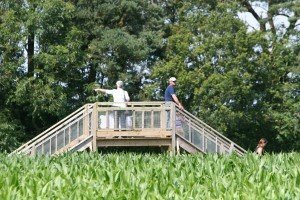 Manydown Farm, near Basingstoke, was looking to diversify and open up areas of the farm for recreational enjoyment. LEADER funding helped to pay towards equipment needed to maximize the potential to attract visitors. The farm had previously developed a maize maze, but grant aid was needed to help pay towards a catering van to provide a café facility. The van was purchased using LEADER funding, and offered locally produced food and a new facility that would give visitors a chance to relax and eat during their visit. The grant also paid for bridge platforms for the maize, trampolines for the children’s play area, as well as tills and software required to improve sales information. The LEADER grant also paid towards fencing to develop a farm walk experience and a marketing plan to help the farm fully develop market opportunities. Guy Drummond, one of the farm’s partners tells us, “Since the farm was funded, the number of visitors has grown significantly, enabling the farm to thrive and further develop opportunities. Manydown Farm now offers visitors a chance to try their hand at go-carts and mini tractors, it has an arts and craft tent and also an adventure play area. We are very pleased with the result and LEADER made a real difference to us”.